FBI Breaks Laws, Covers Up Crimes, Employs Hardened Criminals, Bears False Witness, Provides False Testimony, Plants Fabricated Evidence, Enables Corrupt Politicians, Facilitates Domestic Coups, Protects Pedogate Pedophiles, etc.—Why do we need another crime syndicate to police?! inherited a similar situation regarding the FBI, DOJ, and CIA. Since the release of the FISA Memo, two things have become quite clear. First, that the President of the United States of America is under direct attack by former and present members of the FBI, DOJ and CIA leadership, as well as their many political surrogates and foreign proxies. This unparalleled and perilous predicament has only intensified with so much seditious commentary issuing forth from all the Mainstream Media platforms. Not only former FBI and CIA officials, but other traitors from the U.S. Intelligence Community have likewise stepped forward to reveal their treasonous sentiments and intentions. Secondly, that Deep State has firm control of virtually every major institution inside the Beltway. The swamp, both within and outside of Washington, D.C. , is literally crawling with agents of Deep State (sometimes known as swamp creatures). As such, Deep State essentially owns and operates the U.S. Federal Government. This dangerous situation will continue until President Trump can somehow remove the Deep Staters from their protected Government Service positions. This stark reality poses the single biggest obstacle to the advancement of Trump’s MAGA agenda. It also presents the greatest existential threat to his person, presidency and administration. After all, how pray tell does the President effectively execute his duties when the barbarians are inside the gate (See factoid below). of the Department of Justice which is part of the Executive Branch. The FBI Director reports to the Attorney General, who answers directly to the POTUS. If the American people have learned anything from the FISA Memo, it’s that Deep State will not hesitate to utilize any and all government assets to overthrow the POTUS. The hubris and chutzpah displayed by the nation’s top law enforcement agencies, as indicated by the FISA Memo, are quite shocking. However, it’s the pervasiveness of the DOJ’s systemic corruption and FBI’s systematic criminality that are even more alarming. Of course, the most concerning aspect of the FISA Memo itself is that everyone knows that it represents only a ripple of the ongoing crime wave being carried out as a soft coup. The details of the FISA Memo expose both an endemic abuse of power and serial official misconduct on a scale never seen before; hence, the true depth and breadth of the massive criminal conspiracy can only be conjectured. Because of the ubiquitous surveillance and spying apparatus that is overseen by the U.S. Intelligence Community, it’s apparent that the CIA, NSA, DIA and DHS were all well aware of the coup plot. So, the obvious conclusion is that each of these pillars of Deep State answers to a power structure far outside and/or way above the US government hierarchy. FISAgate has also exposed the degree to which foreign governments influence American elections and governance. As SOTN has previously pointed out, it wasn’t the Russians who hacked the 2016 election, it was the British. The Brits have always treated the USA as if it was still a colony. And it always will as long as agents of the Crown infiltrate the American establishment as they have since before the Declaration of Independence. It wasn’t Russia that tried to fix the 2016 U.S. presidential election; it was the British. At the end of the day, many investigative journalists and scandal researchers will come to understand that FISAgate Proves Deep State Will Do ANYTHING To Remove Trump. And that foreign agents (e.g. UK’s Fusion GPS) were behind the entire scandal from the get-go, as Christopher Steele’s fake “Trump–Russia dossier” graphically illustrates. The exceedingly brazen ‘wiretap’ of the Trump Campaign was likewise a British-run black operation assisted by the UK’s premier surveillance agency—GCHQ. Because Obama spent 8 long years politically weaponizing the nation’s top law enforcement agencies, everything was put into place to pull the trigger on Trump. That institutionalized lawlessness was especially personified by Hillary Clinton and Joe Biden, James Comey and Robert Mueller, John Brennan and James Clapper, Michael Hayden and Michael Morrell, Eric Holder and Loretta Lynch, Valerie Jarrett and Susan Rice, Cheryl Mills and Sally Yates, Nancy Pelosi and Huma Abedin among many other purple revolutionaries. Comey’s total disregard for federal law and generally accepted law enforcement practice / principles especially demonstrates the inordinate degree of power and influence that Deep State exerts on the FBI. Right up to this very day, Comey’s mendacious words and reckless behavior have reflected a full-blown Deep State protection racket of impunity. Only Deep State could confer upon him such a false sense of utter impunity. And Comey’s latest tweet about the FISA Memo is yet another perfect example of his endorsement of FBI lawbreaking. The FBI must be completely dismantled. It can then be rebuilt from the ground up and populated with law-abiding individuals who commit to upholding the law on pain of harsh prison sentences. The CIA should be dissolved post-haste, as President John F. Kennedy intended to do before they assassinated him. The Central Intelligence Agency is truly a hopeless cause. Most of the NSA spying and surveillance operations must be terminated. Much of what they do is unconstitutional, unlawful and/or unethical. The MSM (mainstream media) ought to be first, shut down, and then, taken over, so that it can be operated as a public service; not as a weapon of mass deception. BOTTOM LINE: Here’s the core problem that very few really understand. Every major organ of the U.S. Intelligence Community has been thoroughly ponerized. This grim reality is exactly why the nation is in such a sad state. Several other key US government agencies and departments have likewise been ponerized over decades. Therefore, it’s critical to understand what institutional ponerization means. And, how such an insidious phenomenon translates to the inexorable degradation of the nation. This crucial knowledge about the ponerological Deep State will also explain why the FBI must be dismantled. The Democratic Party is running for cover like never before. FISAgate will prove to be their “Watergate”. Of course, the Democrat leadership knows that they must appear to be on the offensive or else the body politic will see right through their serial prevarication and juvenile deception. That’s why Deep State has continuously trotted out so many bad actors on the public stage to spin the unrivaled crime spree associated with FISAgate. The following video shows just how afraid they’ve become. Nevertheless, the main pillars of Deep State are crumbling before our eyes, especially the FBI, DOJ, CIA, DNC and MSM. However, that does not mean that Deep State will not attempt to prevent its free-fall collapse. As a matter of fact, these ponerized institutions are more desperate than ever as their shocking acts of transparent terrorism indicate. Engineered Train Crash Could Have Wiped Out the Republican Majority in Congress! Hence, it’s of paramount importance that the patriot movement remains ever so vigilant. The single best disinfectant has always been sunlight, so shining light on Deep State’s dastardly plots will only hasten its collapse. Ultimately, even the top decision-makers will be exposed, which will then take down the Shadow Government that directs Deep State. 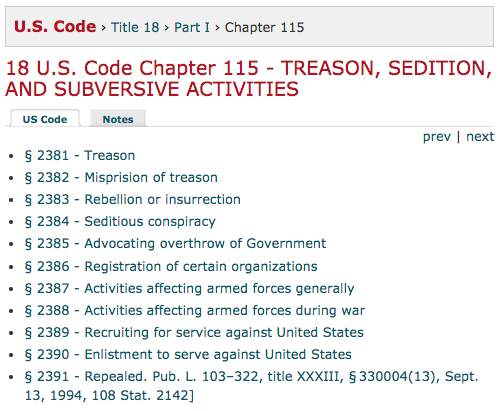 Treason, sedition and other subversive activities are extremely serious crimes under any circumstances. When the nation’s top law enforcement agencies are committing the crimes, and covering up those of their co-conspirators, they have surely outlived their usefulness. When the criminal activity rises to the level of treason, as it has with both the FBI and DOJ, they have become so incorrigible as to demand aggressive prosecution. What follows is a list of some of the more egregious felonies that are applicable to the burgeoning FISAgate scandal. because he knows exactly what they have done. Some commentators have balked at the prospect of dismantling the Federal Bureau of Investigation. A reasoned response to them is: what does the FBI really do but cover up the most serious white-collar crimes, as well as go after the white hats who have been targeted by the black hats. In other words, the FBI’s primary role is to serve as a highly paid government-run protection racket for the some of worst RICO offenders, both institutional and individual, on the planet. Just ask the many big metro mafias about this service that’s rendered at taxpayer’s expense. The most glaring example of flagrant FBI corruption is how FBI Director Robert Mueller was used to cover up the worst terrorist attack in U.S history known as 9/11…for 12 straight years. What did Mueller’s FBI ever accomplish or solve with regard to this “CRIME OF THE MILLENNIUM”? Next, let’s examine the FBI’s investigation of the Las Vegas massacre on October 1, 2018. How has the Bureau addressed the largest mass shooting in U.S history? Answer: With intentional incompetence, willful neglect and transparent deception. Today’s FBI, just like J. Edgar Hoover’s FBI, literally operates like the Russian KGB or East German Stasi during the most oppressive period of the Communist era. Not only does the FBI also function like the Nazi secret state police — the Gestapo — they do so completely under the radar. In this way, no one really suspects them but those who have experienced their institutional criminality and thuggery (e.g. American Patriot Indicts 3 FBI Agents Who Murdered LaVoy Finicum In Cold Blood ). The FBI also carries out special orders in matters of feigned ‘national security’ and intelligence-gathering. Especially where it concerns false flag attacks on the American people perpetrated by rogue elements in the U.S. Intelligence Community does the FBI provide serious official cover. They did exactly this when JFK, RFK and MLK were assassinated. For such an egregious betrayal of the America people, the Bureau ought to be shut down—NOW!